Mind Driving is a new approach to driving skill to help reduce crash risk. It also reduces stress and increases the enjoyment of driving. It is part of the Skilldriver road safety project. Mind Driving reveals the untaught skills that really make driving safe. They are the "thinking skills" that allow drivers to control danger. Expert drivers use these skills, but they have not been explained before. and a linked module on Young Drivers is also available. Please use contact to make an enquiry. Driving Instructor groups use these events as part of their Continuing Professional Development (CPD). Read about a four day MIND DRIVING training event for instructors in Scotland. CARkeys and ITV Motoring"This is the best book I have ever read on the subject of road driving, and perhaps the most important that has ever been written." Read the full review. read it. "Review 2"If the Government reads the most important new book on road safety for years it could have an earth-shattering impact on its policy." people learn to drive. Every driver should read this book. No one involved in driver training or road safety can afford to be without it." Further endorsements inside the book include the RAC Foundation, the AA Motoring Trust and other experts in road safety and driving. saw Mind Driving it has been at the heart of our training - for young learners, advanced, nervous or elderly drivers. It unlocks the secrets of safe thinking, and we have proved these are teachable skills. Every driver who wants to be safe should read this book." model struck home with many in the audience, and his quiet but engaging delivery went down very well. On behalf of Bristol Advanced Motorists and the whole audience, thanks to Stephen for being such an important part of a very successful, enjoyable and informative day." and we are very pleased with the result. The aims of Mind Driving align directly with our broader Health and Safety objectives, and we will be recommending the approach to other BP sites." Walkers Foods"To help extend our safety programme into the critical behavioural side of driving, Walkers held Mind Driving workshops run by Stephen Haley for the trainers and managers. Feedback shows that this was extremely successful. "The ongoing training programme for Walkers truck drivers now includes highly popular modules on Mind Driving. Newbury IAM"Many thanks for your superb talk last night - everybody was highly impressed. This was, by far, the most successful and stimulating Group evening that I can remember." "stunning" during the talk, and he's been 'into' advanced driving for quite some years. We wholeheartedly recommend Stephen's talk to other IAM/ROSPA groups." these skills were used by instructors and included in the DSA syllabus, we would produce far safer novice drivers than we do today." "Thanks for a 'knock-out' presentation last night. The members seemed enthralled. We will be contacting IAM HQ about this approach." "I just finished your book "Mind Driving"
compartmentalised, for helping novices learn to experts instruct." techniques. But that totally changed when we got hold of a copy, and we now use the approach in our training of Learners and Instructors. The techniques are easily adopted in the car, and for trainee instructors this book is essential reading. We applaud the contribution that Mind Driving makes to road safety and driver education." (Northern Ireland) "Mind Driving is one of the most common sense driving books that I have ever read. I have been so impressed that I give a copy to every one of my customers. I have found a BIG difference in their understanding of what is required behind the wheel - in how to deal with situations, and in planning not just reacting. Well done." a unique breakthrough in driving skill, that is fully centred on how drivers think. It will change your perception of safe driving, and we highly recommend it to all drivers." 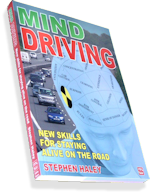 book is a major step forward in encouraging drivers to develop their 'thinking' - from novice through every stage of essential ongoing driver development." responsible attitudes. The best time to influence how drivers think is pre-licence, and Mind Driving fits this ethos perfectly. It explains the critical thinking skills in a way that is new but easy to use. Our novice drivers have much lower accident and conviction rates. We highly recommend the Mind Driving approach to all drivers and believe it should be built into Learner training as standard." different and productive approach. Just what we wanted, and lots of positive feedback on being able to think about and control risk much better when driving. The reminder notes and certificates for the attendees are also greatly appreciated." Mind Driving to all riders. For the first time it takes riding beyond the traditional Roadcraft method. It complements The System brilliantly, and shows riders how to drastically improve safety by taking real control of their road space. Just one especially critical idea for riders is to see themselves as part of hazards, and not simply victims of other drivers." delighted to have been given permission to offer the 'Sense of Danger' section of Mind Driving as a free download from our website." experienced drivers will benefit from reading it." needed book, that successfully addresses what real world safe driving is all about and why accidents happen... all done in a way that will make the general public sit up and take notice. We will be recommending Mind Driving to all our trainees and customers." enthusiasm you have clearly brought to the subject of driving safely, and plan to cascade your message where possible." seminar grew in strength with each presenter, culminating in a very mind stretching and enthralling presentation. As Chairman of the Region I thoroughly recommend Steve's efforts to educate the 'powers that be' via "Mind Driving" and also advocate the research and theory behind the presentation. Other MSA Regions are highly recommended to use the book and the presentation as part of any CPD seminar. In conclusion: Outstanding!" to enhance our driving and life", "Superb talk on Tuesday, a real paradigm shift for me - experience CAN be taught"." it. The committee are keen to consider holding a workshop, and we will be contacting you again." Workshop: "Thanks for a brilliant days training yesterday, we all enjoyed it. Please send the Conditions of Use so we can use extracts." the thanks – Thanks Steve!!" think and behave. Very useful for our driving instructor members, and based on your research and presentation, we can develop our strategy to encourage younger members into the Group. We are really pleased to have the follow on presentation, well done Steve." instructors, with members of IAM and RoSPA. Comments received during the break and at the end were very enthusiastic. Further positive ADI comments on Facebook included: "Mind Driving! Enjoyed the CPD presentation, very interesting, and a new angle on instructing." and "I've been pushing Speed/Surprise/Space today. Makes 'em think!"." give this approach serious consideration." Guildford & District IAM"Thanks very much for a really inspiring and thought provoking talk. A couple who had seen it before said it was even better the second time. We will certainly recommend to other groups." from someone outside the industry. We look forward to seeing your progress with the DSA." interesting. I've had yet more positive feedback even since emailing you. I have no doubt we would benefit from another session at some point so I will be in touch in future." felt you came to it from a very different and original angle than others in the business. Plenty of 'nuggets' of information to take away and digest, and use to make our pupils THINK about their driving. "This session was tailored to focus on "Understanding Young Drivers". them a solid grounding in safety in addition to being prepared for the test. It makes them think and helps them learn some vital points more quickly. We are continuing to develop this teaching to be even more sure that we are training new drivers in all of the skills they need for a long and safe motoring career." have developed the Mind Riding training course as a combination of study and on-road riding, based on Mind Driving as the core text. It captures what it means to master the skills of the Expert rider - enjoying themselves and riding safely. It really is about how you think!" the cognitive aspects of driving mastery. Rather than focusing on the motor skills, Mind Driving addresses what matters most in respect of driving safety - the human aspects of driving." the most prominent figures in the industry. They also run the annual Blue Light Users Conference. "A refreshing approach to driving which places emphasis on self-reliance, attitude and responsibility. A welcome addition to the shelves of driver training manuals."